Update your home with the look of authentic granite for an affordable price with this set of granite self adhesive surface covering. The coverings offer lasting decorative protection for heavy traffic areas like counter or table tops and it can even be used on walls! 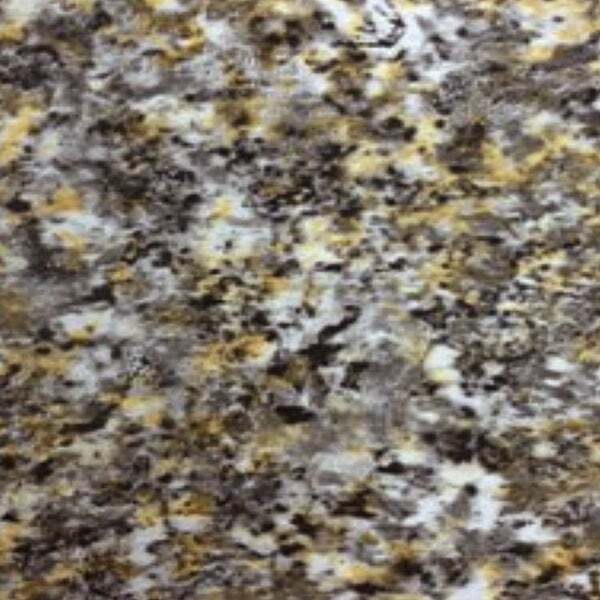 The gold whirl granite finish is a beautiful addition to any space that adds a luxurious look to any home. "Can this be put over laminate counter top and how sticky is it cause part of my counter has laminate away from base partical stuff cause of water leak from water flow from leak but small area don't need to replace whole top . " Yes, this can be placed on top of a laminate counter top. You may need to do some additional prep to ensure that the vinyl is sticking to the laminate and not the particle board below. There are a lot of DIY videos on YouTube that should be able to assist with this. "Can this be put over tile???" Hello SM, yes, it can be put over tile. Thank you for shopping with us! "How easy does this peel off? If I were to put it in my apartment, I don't want to be charged for repairs if it does not peel off or if it takes the finish off of anything. Thank you for your answer." Hello pollylay, this is perfect for rental or apartments, this can be easily removed and should not damage the surface beneath. Thanks for shopping with us!